Below is hopefully the most complete guide to holy and healing wells books. Any omissions please let me know! 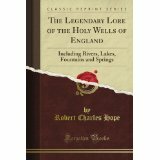 The Legendary Lore of the Holy Wells of England: Including Rivers, Lakes, Fountains and Springs by Robert Charles Hope (1893) The first book on the subject, setting the template of country research and still an invaluable source. Low on analysis but high on antiquarian flights of fancy it is still a great book. Holy Wells; Chapter one Church Treasury by Cuming Waters. A slim volume reprinted in the 1990s by Heart of Albion. Gives some interesting examples but very Victorian in outlook. 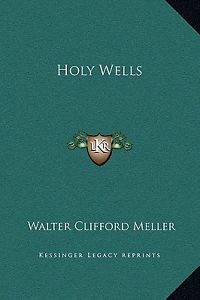 Holy Wells by Walter Clifford Meller (1923) A slight review of the subject and generally only available as a facsimile copy. 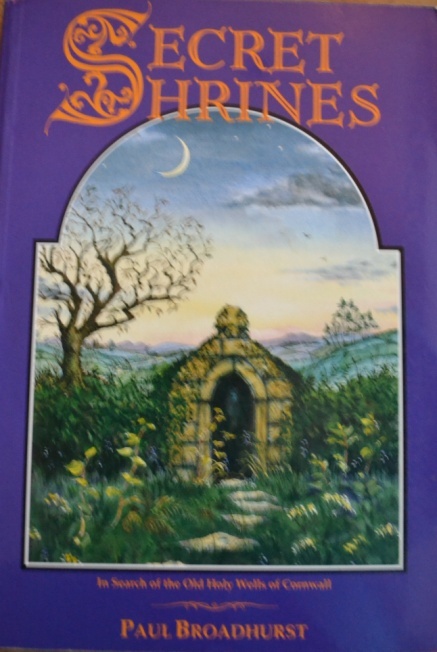 Sacred Waters: Holy Wells and Water Lore in Britain and Ireland by Janet Bord and Colin Bord (1986) It was this book bought back in a Truro bookshop in the 1980s which got me into the subject. A brilliant read, over emphasises some of those neo-Pagan views too much sometimes, but does give an excellent overview. Very useful gazetteer at the back too which I still use! Cures and Curses: Ritual and Cult at Holy Wells by Janet Bord (2008). A useful dictionary response to the subject and an excellent source book. A brief gazetteer at the back mainly as an introduction and a taster for the book below. 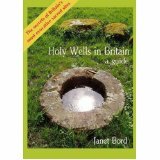 Holy Wells in Britain: A Guide by Janet Bord (2008) A worthy and more useful perhaps for the researcher follow up from Sacred Waters. An excellent county by county guide using knowledge discovered since that eponymous title including some of my work but too early for my recent research. 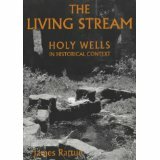 The Living Stream: Holy Wells in Historical Context by James Rattue (2001) First authoritative attempt to get an overall analysis of the significance of holy wells and associated water bodies to society and history. Well written and although some authors disagree with some of the points, it is an essential read for anyone interested in the topic. The Water of Life: Springs and Wells of Mainland Britain by Ian and Frances Thompson (2010) The authors give a scholarly approach to the subject selecting wells to emphasize key phases in the use of water for ceremonial and domestic uses. Very readable and should be more widely available as a good introduction to the subject. 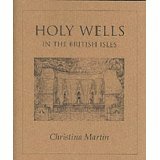 Holy Wells of the British Isles by Christina Martin (2000) An attractive book of illustrations made by the author with notes and a brief gazetteer. A good gift book but not very informative. 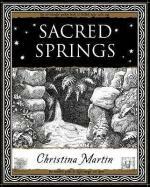 Sacred Springs by Christina Martin (2008) Another attractive book of illustrations made by the author with notes and a brief gazetteer. A nice gift book. 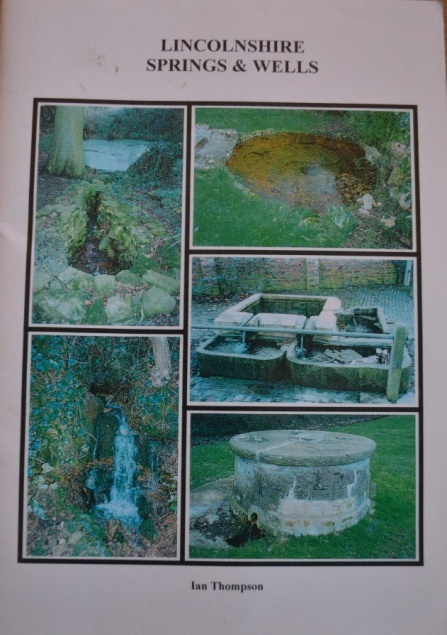 The Magic and Mystery of Holy Wells by Edna Whelan (2002) Edna’s research into Yorkshire holy wells see below is perhaps better known, however she draws upon this and other snippets for other UK sites to give a quick guide as the title says their magic and mystery. A bit heavy on the New Age neo-pagan interpretations perhaps but a good read. 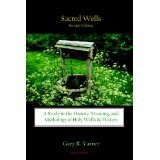 Sacred Wells: A Study in the History, Meaning, and Mythology of Holy Wells & Waters by Gary R. Varner (2009) A global prospective good for American sites with a good comparison with other cultures but generally sourced from other books and some of which not that academic. The British section is woefully full of spelling mistakes..quite comically so. Having said this it’s certainly worth purchasing and a good first attempt of a global perspective if a little romanticised. 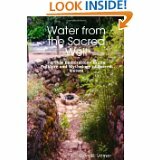 Water from the Sacred Well by Gary R. Varner (2010). Not yet read and not as generally available as the above, a further exploration. 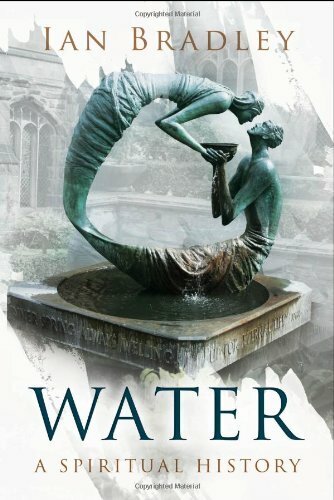 Water a spiritual History by Ian Bradley (2012) An academic overview which I have yet to purchase. 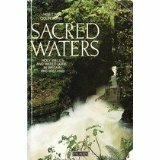 Holy Wells and Sacred Water Sources in Britain and Ireland by Arthur Gribben (1992). An expensive book which attempted back in 1992 to provide a bibliography, worth picking up if seen but it is just a bibliography! A History of Water, Series II, Vol. 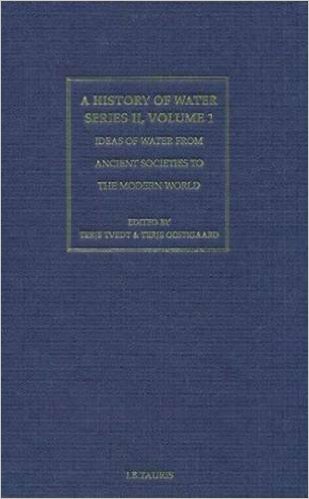 1: Ideas of Water from Ancient Societies to the Modern World (History of Water: Series 2) by Terie Tvedt and Terje Ostigard (2009) Academic work which discusses water lore. 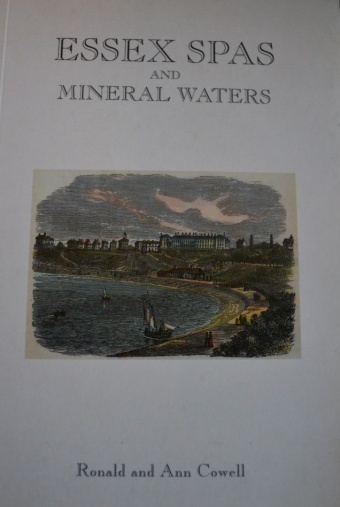 The Natural, Experimental, and Medicinal History of the Mineral Waters of Derbyshire, Lincolnshire and Yorkshire by Thomas Short (1734) Very expensive as first edition by available on Google books as free pdf. 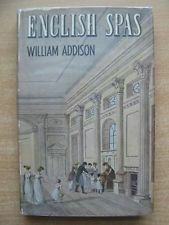 English Spas by William Addison (1951) a good introduction with a section on holy wells. Discovering Spas by R.L.P and Dorothy Jowitt (1974). Surprisingly very informative for a small book as many Shire books are of course. Hundred British Spas by Kate Denbigh (1983) A very easy read and with some excellent maps. 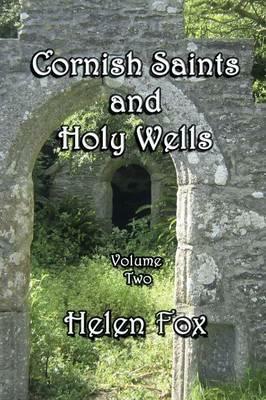 An excellent introduction to the subject with some mention of holy wells. 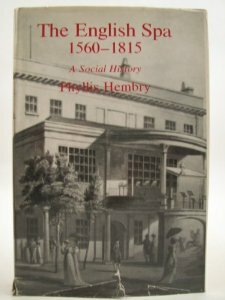 British Spas from 1815 to the present Day by Phyllis M Hembry and Cowie (1997) a historical overview of spa usage from a social point of view. 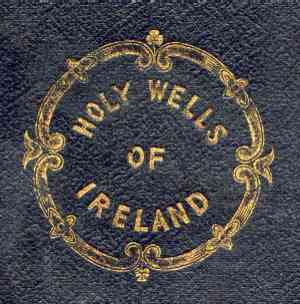 The holy wells of Ireland: Containing an authentic account of those various places of pilgrimage and penance… by Philip Dixon Hardy (1836). Impossible to get hold of and rather biased. A pdf is available here. 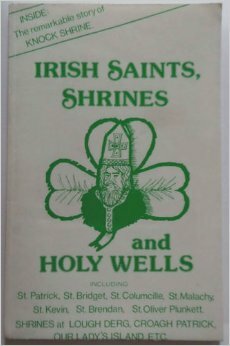 Irish Saints, Shrines and Holy Wells by Mac (1980) I’ve not yet read this so I’ll update later when I do. 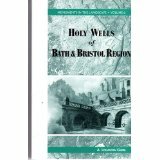 The Holy Wells of Ireland by Elizabeth Healy (2001) An enjoyable personal journal of some of the major sites in the county. Helpful with locating existing site but would have benefited with a gazetteer. 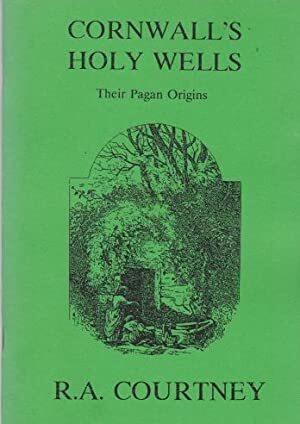 The Holy Wells of Ireland by Patrick Logan (1981) A fairly comprehensive overview of the subject with some excellent observations, but again lacking a gazetteer. 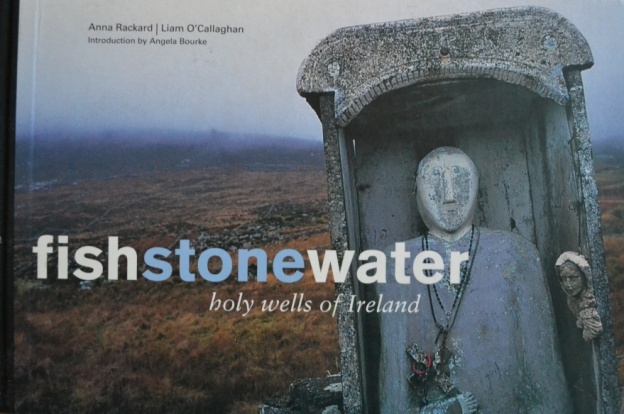 Fish Stone Water: The Holy Wells of Ireland by Anna Rickard and Liam O’Callaghan (2001) A delightful book a cross between a personal exploration of the ceremonies and customs associated with a wide range of sites and some very evocative photos. Took this to Ireland and it really does sum up the country brilliantly. A great coffee table book too. 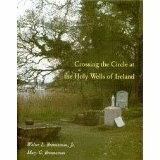 Crossing the Circle at the Holy Wells of Ireland by Walter L. Brenneman, Mary G. Brenneman and Walter L. Brenneman Jr (1995) The reviews are not favourable, but it is an okay work. Suffers from some flights of fancy and lack of academic rigour but for some readers that will right up their street I guess. 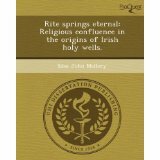 Rite Springs Eternal: Religious Confluence in the Origins of Irish Holy Wells by Silas John Mallery (2011) I’ve not yet read this so I’ll update later when I do. 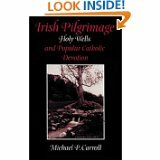 Irish Pilgrimage: Holy Wells and Popular Catholic Devotion by Michael P. Carroll (1999) An excellent academic book, useful as a source book for a more scholarly examination of the subject. A very good academic read. The Holy Wells and religious cults of County Cork by Noella T Dowling (1989) Strictly speaking a thesis but bound book copies do turn up! Reassessing the Irish holy well tradition by Paddy Doyle (2006) Strictly speaking a thesis but bound book copies do turn up! A study of popular religion with an emphasis on a selection of holy wells from south county Tipperary by Keiran R Walsh (1995) Strictly speaking a thesis but bound book copies do turn up! 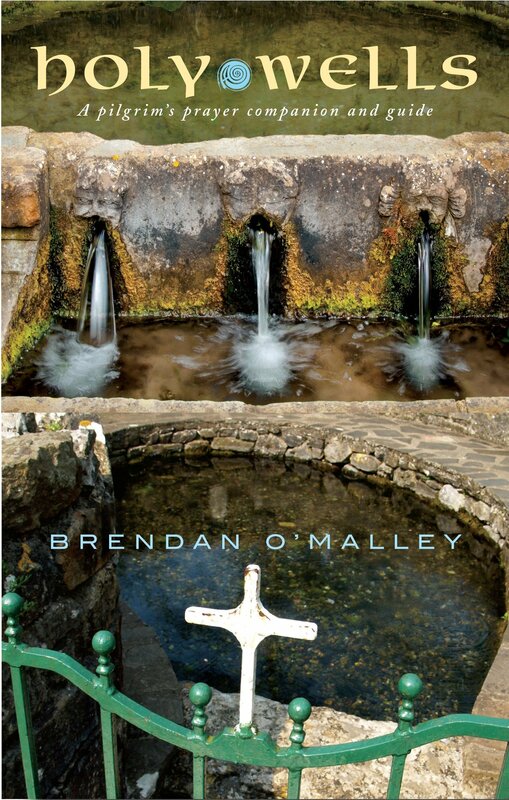 Fingallian Holy Wells by Petra Skyvova (2005) A good little guide to County Dublin sites. 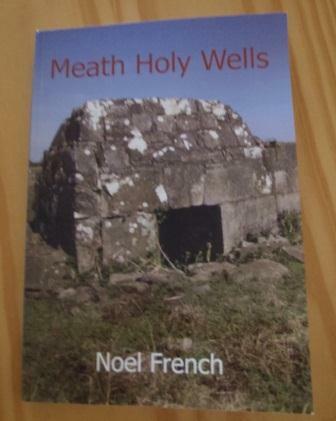 Meath Holy Wells by Noel French (2013) I’ve not yet read this so I’ll update later when I do. 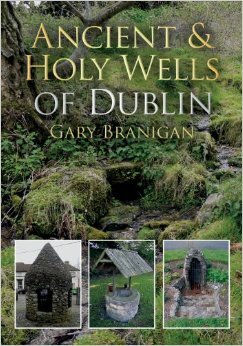 Ancient and Holy Wells of Dublin by Gary Branigan (2012) I cannot recommend too highly see here. 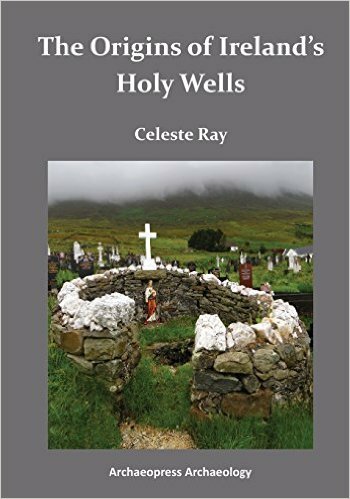 The Origins of Ireland’s Holy Wells by Ray Celeste – does what Harte does for England. 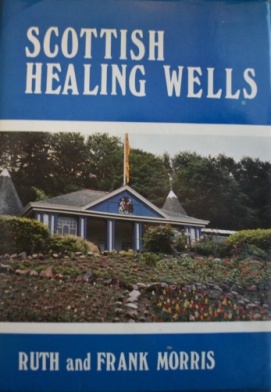 Scottish Healing Wells: Healing, Holy, Wishing and Fairy Wells of the Mainland of Scotland by Ruth Morris and Frank Morris(1982) A brilliant and so far surprisingly only attempt to produce a comprehensive county by county guide. An essential book if a little difficult to track down. 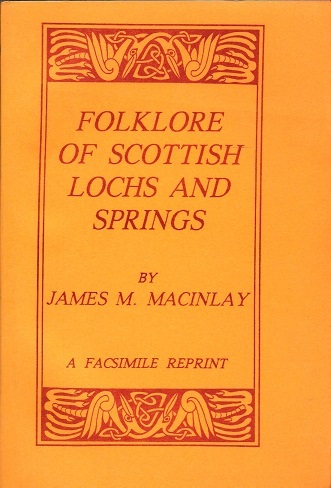 Folklore of Scottish Lochs and Springs by James M. MacKinlay (1895) A romanticised work by a good compendium of traditions much in the shadow of Fraser’s Golden Bough and generally available as facsimile or here. 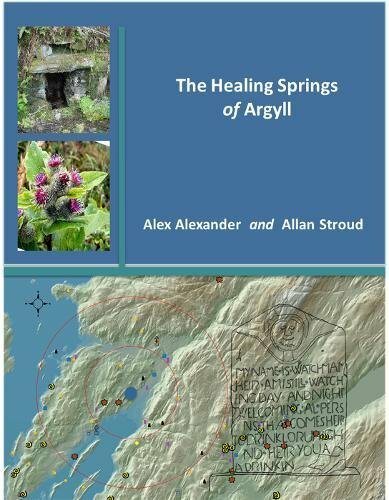 The sacred waters of Argyll: exploring healing waters within their archaeological landscapes by Alex Alexander and Allan Stroud (2017) haven’t tracked down a copy yet it was due out in 2015 also called Healing springs of Argyll. It uses archaeology to discuss the sites and also acts as a field guide should be good! 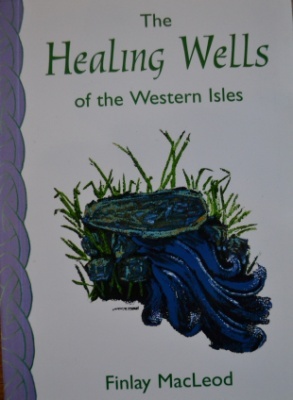 The Healing Wells of the Western Isles by Finlay MacLeod (2004) A delightful pocket book detailing all the sacred wells in this remote part of Scotland. Hopefully this could be the trailblazer for a series of countywide gazetteer. 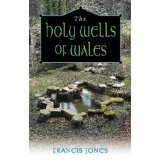 The Holy Wells of Wales by Francis Jones (1955) One of the three essential reads of the subject, even if you don’t ever visit Wales! I’ve used his classification system. The first book to attempt an academic review of the subject and although it is nigh on impossible to successfully use as a field work book it does give valuable pointers to sites. 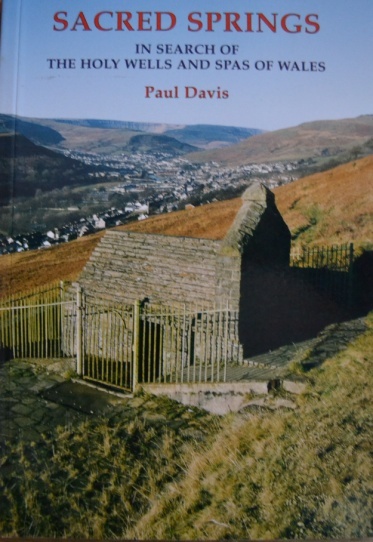 Sacred Springs: In Search of the Holy Wells and Spas of Wales by Paul Davis (2004) A well researched and illustrated with good sketches and photograph. Not comprehensive but the author selects the best sites for newbies and old hands to visit. Recommended. 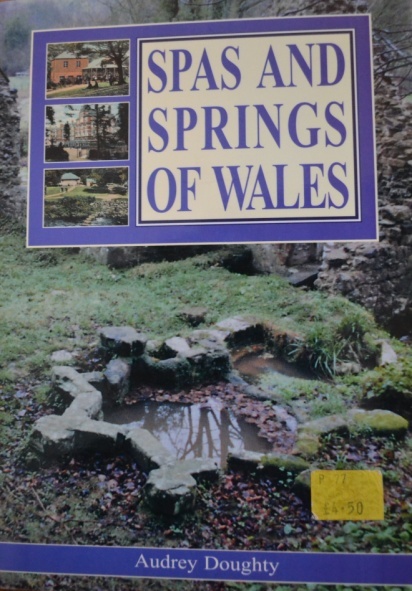 Spas and Springs of Wales by Audrey Doughty (2001) Mainly focusing on spas as the title suggests and more a history of the major sites. A good read covering a less studied area. Sacred Wells In Wales A Paper by Sir J Rhys (1893) basically a paper, a transcript of which is available by clocking the link but something pressed as a small book. 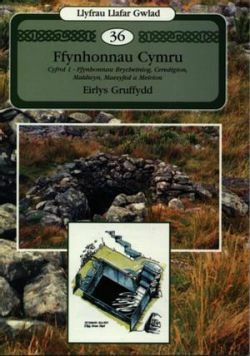 Ffynhonnau Cymru: Ffynhonnau Brycheiniog, Ceredigion, Maldwyn Maesyfed a Meirion v. 1 By Eirlys Gruffydd and Ken Gruffydd (1997) Welsh language guide to wells in these counties. 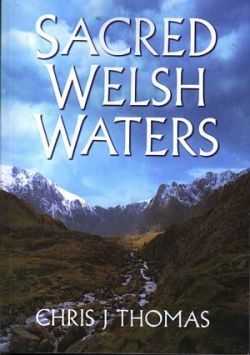 Sacred Welsh Waters by Chris J. Thomas (2005) Despite the author going into familiar territory, this is an extensive work of 120 sites and thus essential, especially as in a few examples the author has visited nearly every site. A pdf Kindle version is also available for a fraction of the price. 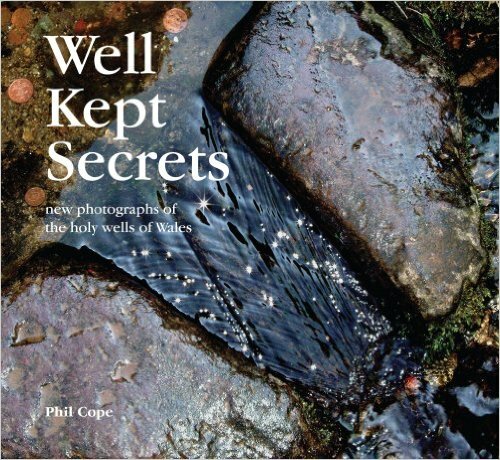 Well Kept Secrets: New Photographs of the Holy Wells of Wales by Phil Cope (2007). The authors much more difficult to find first foray into the subject. I’ve not seen this one so I do not know how this compares with his latter excellent work. 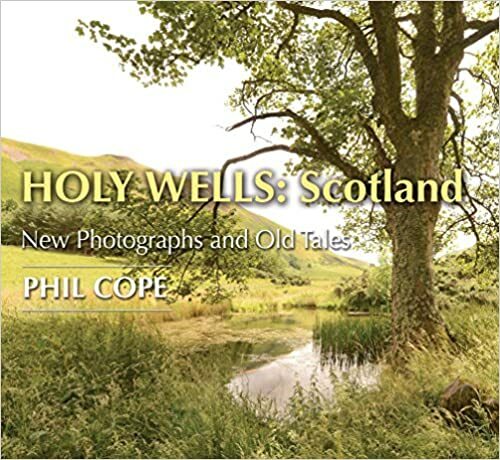 Holy Wells: Wales: A Photographic Journey by Phil Cope (2008) A great year for the subject, this is a beautiful book. Perhaps a little too large and lovely to take into the field but an emotive attempt to connect via luminous photos the spirit and magic of sacred waters. An essential coffee table book and one to get out for the non enthusiast. 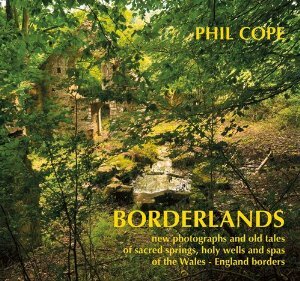 Borderlands: New Photographs and Old Tales of Sacred Springs, Holy Wells and Spas of the Wales / England Borders by Philip Cope (2013). Another great work, beautiful and covering the borders on both sides. Again a must have. 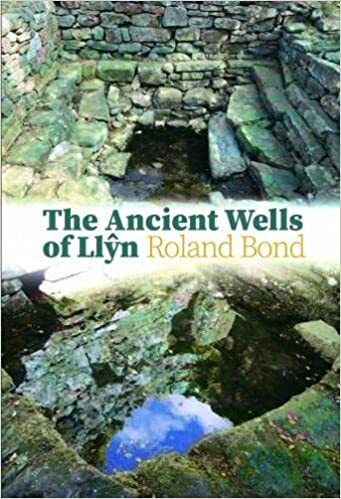 Ancient wells of the Llyn By Roland Bond. 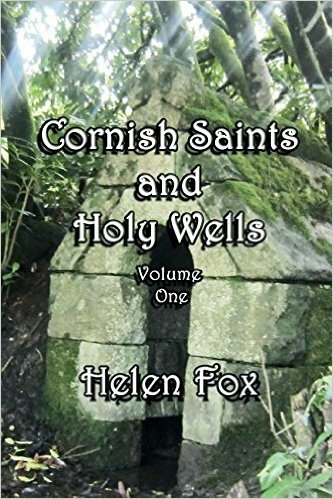 An excellent guide to the wells of the peninsula not all of them holy or healing but fascinating nevertheless. If you intend visiting north Wales it is a must. Unholy Water? 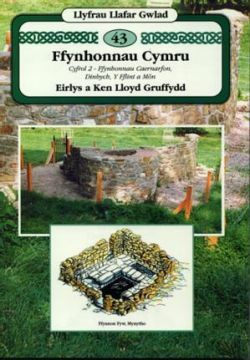 Ffynnon Elian ‘The Cursing Well.’ By Jane Beckerman (2017) Much awaited monograph on this infamous well by its current landowner and restorer. 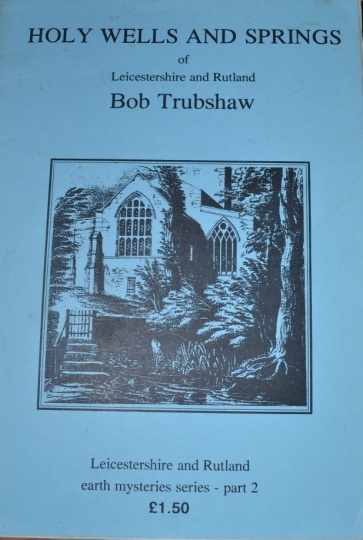 Survey of ancient buildings II Bygone Water Supplies by J. Elliott Steele (1932) a ground-breaking guide to named and otherwise water supplies includes a large number of holy and healing wells in this little surveyed county. Rare as hen’s teeth though. 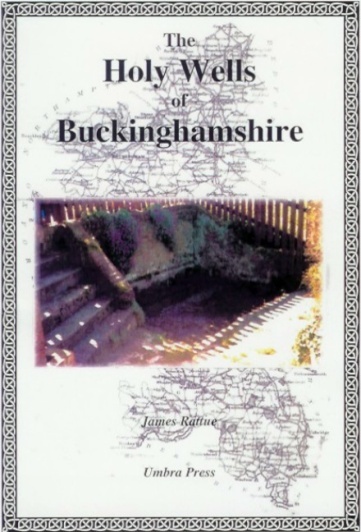 The Holy Wells of Buckinghamshire by James Rattue (2003) James produces the first book from years of well research and an excellent volume it is too! 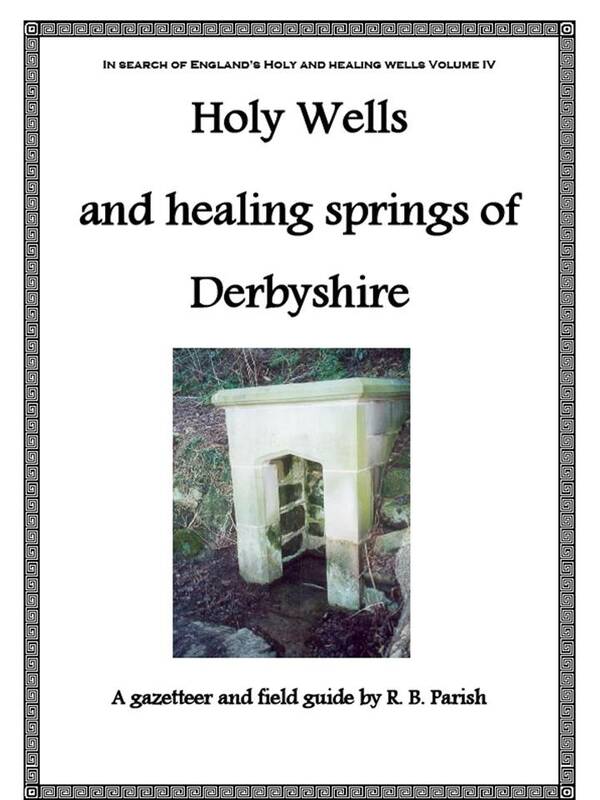 A county gazetteer including all well sites, whilst I wouldn’t necessarily call them all holy wells as the title suggests, hence my volumes healing wells and….subtitle, I cannot fault the work but in. Essential especially as it covers a county in an area, the Home Counties, poorly covered, before. Hope (1893) only had one site! Cheshire – no book yet! 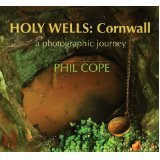 Holy Wells, Cornwall: A Photographic Journey by Phil Cope ( 2010) Book number two in his evocative photographic series. Informative as it is beautiful another book which crosses academic work with the coffee book. Essential. 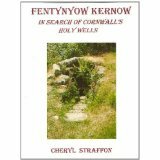 Fentynyow Kernow: In Search of Cornwall’s Holy Wells by Cheryl Straffon (2005) Culmination of the author’s previous three volumes on ancient sites in the county. Perhaps a bit too New Age neo-pagan in parts, but as this is Cornwall I am sure we can excuse this. Absolutely essential if visiting I love it. 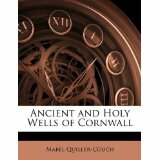 Ancient and Holy Wells of Cornwall by Mabel Quiller-Couch (1894) An early trail-blazer, beautifully illustrated and well written. Remains the source book for the county and surprisingly still a useful source book. Secret Shrines: In Search of the Old Holy Wells of Cornwall by Paul Broadhurst ( 1991) A rare beast produced at first in a limited edition subscription with a small print run afterwards. A lovely book part history part gazetteer with some delightful stuck in photos. A bit New Age again, but enjoyable. 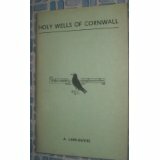 Holy Wells of Cornwall by A. Lane-Davies (1970) First book to re-evaluate and re-visit the topic in the county (and first generally since Jones work in 1955), this is an excellent gazetteer with some very useful photos which still is the only source of photos for these sites. 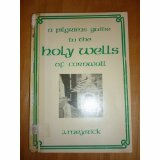 Holy Wells: A Pilgrims Guide to the Holy Wells of Cornwall and Their Saints by J Meyrick (1982) Twelve years on and this work builds upon the above to produce the most comprehensive book so far with excellent instructions and not just focusing on the picturesque. Again with excellent photos. 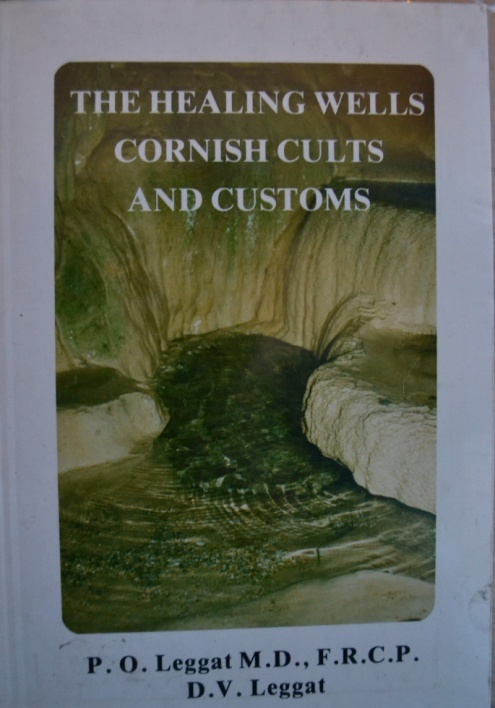 Healing Wells, Cornish Cults and Customs by P.O. Legatt and D.V. Legatt ( 1988) An attempt to look at the topic in the joint approach of medicinal waters and custom. Not one hundred percent sure it works but with excellent notes and photos in adds rather than detracts from the cannon of work on the subject to provide a rarely found guide. 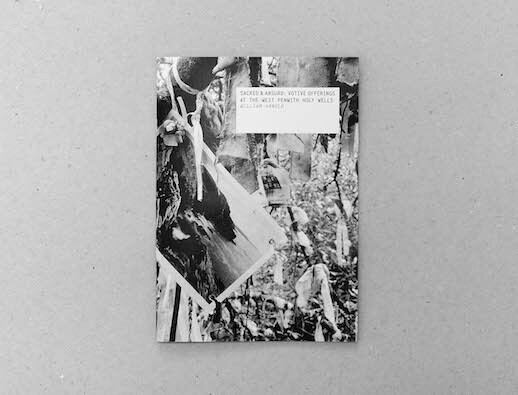 Sacred & Absurd: Votive Offerings at the West Penwith Holy wells by William Arnold Delightful little monograph of photos of the weird and wonderful objects left at Cornish holy wells. Very little writing, indeed nothing about the wells but a great testament to what appears to be a growing and somewhat controversial custom. Limited to 50 copies. 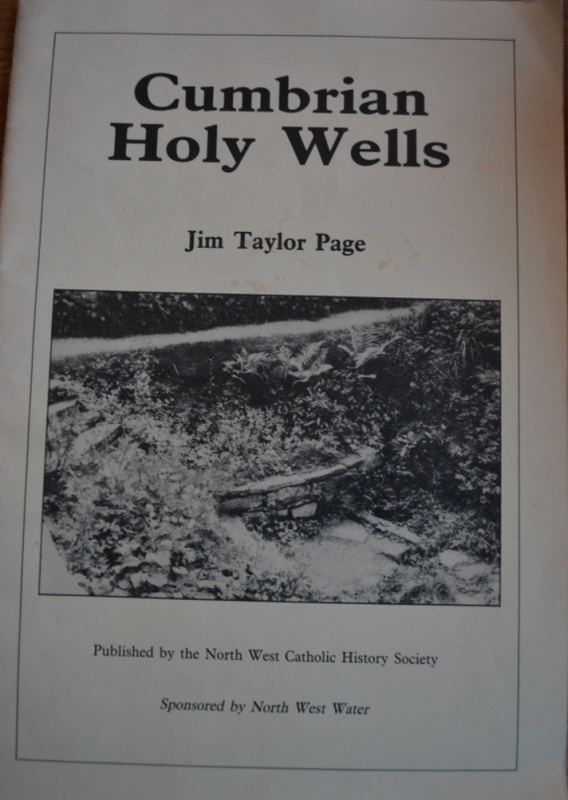 Cumbrian Holy Wells: A Survey of the History and Legend of Ancient Water Sources in Cumbria by Jim Taylor Page (1990)A well written analysis, with despite being published by a Catholic society is not overly so in its approach. With an interesting gazetteer including a number of different aspects. Includes some good photos and useful as a starting point for a fuller county guide. 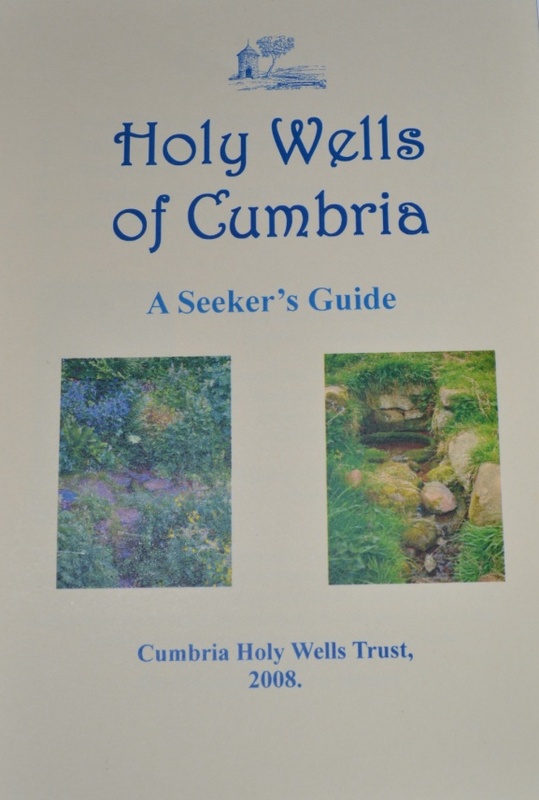 Holy Wells of Cumbria by Gill Edwards (2009) An excellent attempt to provide a field guide to some of the best sites in the county and clearly a starting point to some more scholarly work. Each site is well described and has a photo. Despite the author’s association with holistic medicine and the like this book does not suggest so. Sadly the author recently died and one hopes that the good work will be continues by her colleagues. 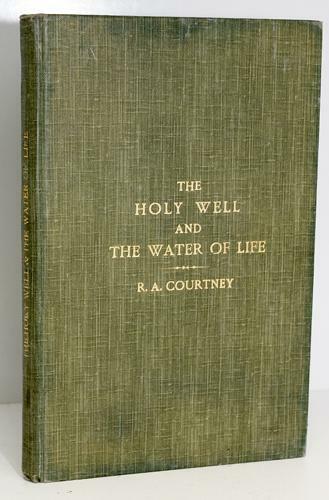 Springs of Living Waters: The Holy Wells of North Cumbria by Father John Musther. 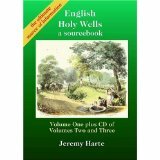 (2015) This definitive book on the holy wells in North Cumbria, UK, details around 70 holy wells; there are also notes on the ‘lost’ holy wells. 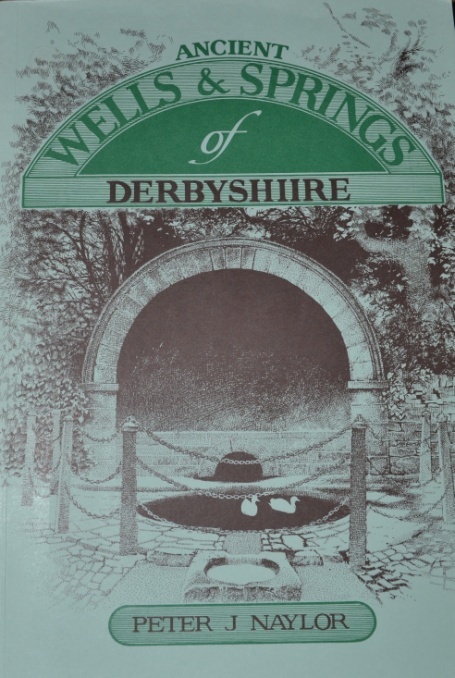 Ancient Wells and Springs of Derbyshire by Peter J. Naylor (1983) An interesting book which includes some holy wells but mostly spa springs and touches upon the allied subject of well dressing. However, most of it appears to be concerned with industrial uses and water supplies. It’s an okay book, but with a title like that you’d expect more! 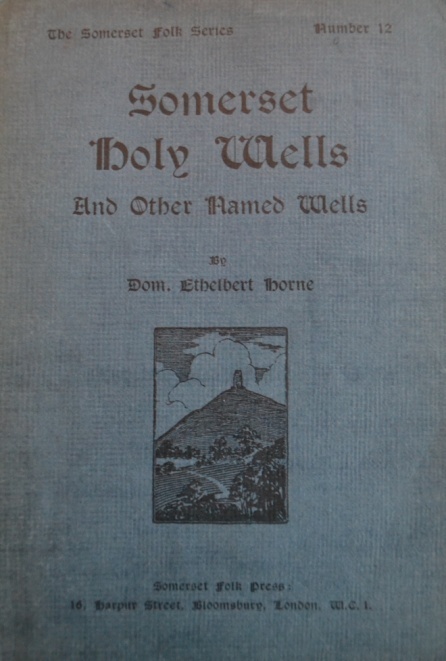 The Holy Wells and Healing Springs of Derbyshire: A Gazetteer and Field Guide to Holy Wells, Mineral Springs, Spas and Folklore Water (In Search of England’s Holy Wells) by R. B. Parish (2011) The fourth of my volumes and obviously the most useful book on the subject in the county. 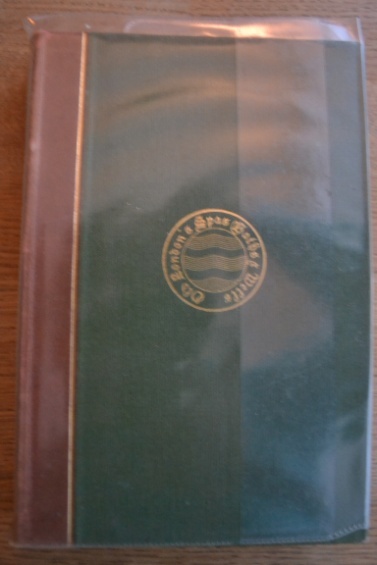 Buxton Water: History of Buxton the Spa by Mike Langham (1986) a very good overview of its ancient and modern history. 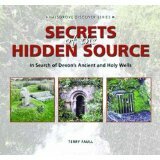 Secrets of the Hidden Source: The Search for the Ancient and Holy Wells of Devon by Terry Faull (2004) Terry produces an excellent guide to this under-researched county with region by region guides. With useful instructions and photos this is a useful if rather odd shaped and too beautiful field guide. My only criticism from a research point of view that it only considers extant sites in any detail, but that’s a minor problem. Essential. The Story of Our Lady’s Well, or Lidwell Chapel by Frank Parsons (1991) A nice monogram on the site. Dorset – no book yet! 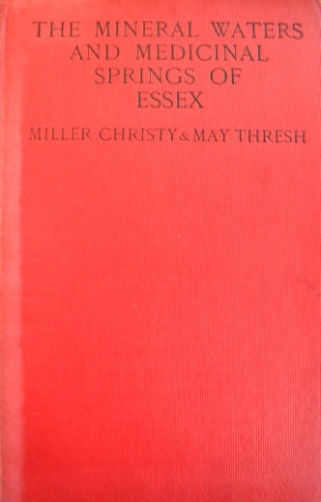 Mineral springs of Essex by Christy and Miller (1910) A rare compilation of their works in the Essex Naturalist. With useful photos, chemical analysis and histories this is the essential starting point for research in the county, although despite the dubious Chad’s well, does not really consider holy wells. 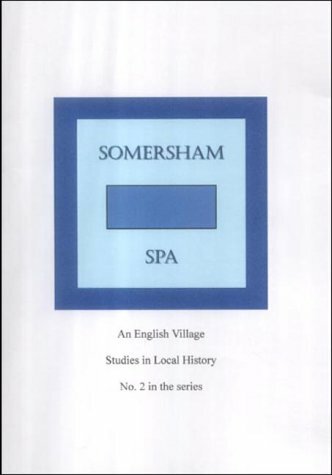 Essex Mineral spas and mineral springs by Ronald and Ann Covell (2008) Coming into press the same year as my work below, this is nevertheless still dependent on Mineral springs and spas and both works are clearly essential (especially below). Very informative histories of the sites with a good selection of prints and photos. 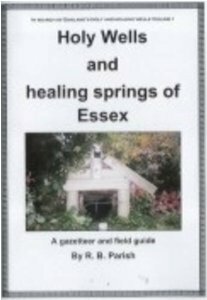 Holy Wells and Healing Springs of Essex: A Gazetteer and Field Guide to Holy Wells Mineral Springs Spas and Waters with Associated Folklore by R. B. Parish (2008) Despite typo (Polslore indeed!) 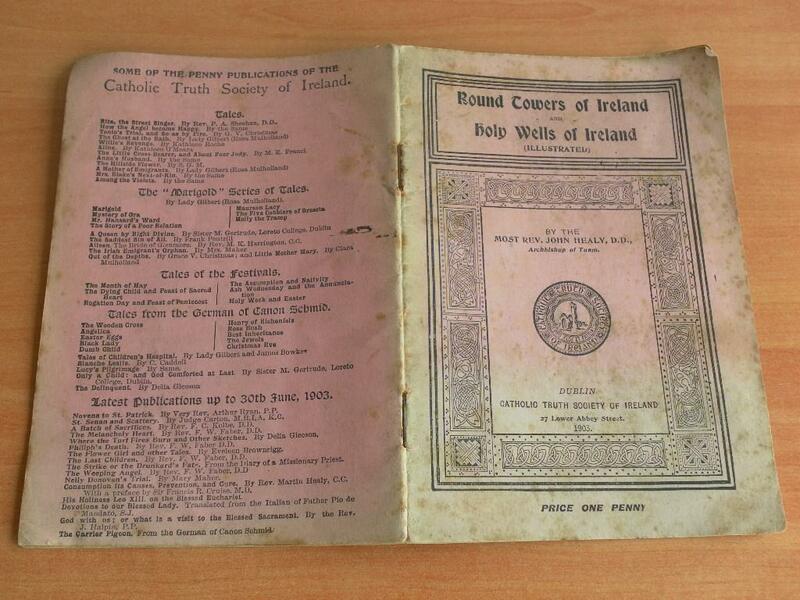 my first volume covers a county very poorly covered county and includes more holy wells than the above. The Running Well mystery by Andrew Collins (1983) A great monogram on the rediscovery of this important Essex site. 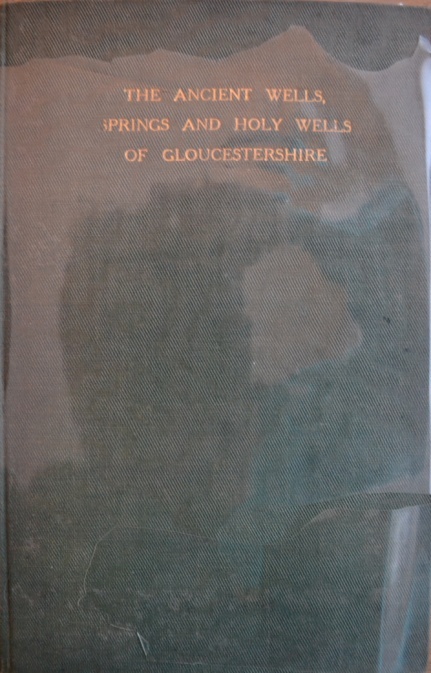 Ancient wells, springs and holy wells of Gloucestershire by Skyking-Waters (1923) Perhaps the best pre-1980s book on the subject, copiously illustrated and authoritatively written. It is very readable and still very useful as a field guide and a source for further research. It is a shame he died before finishing his Yorkshire work. St Lawrence’s Well: A Fragmentary Legend of the Isle of Wight, By Henry Brinsley Sheridan (1845) see downloads. A poem telling of the legend but interesting. 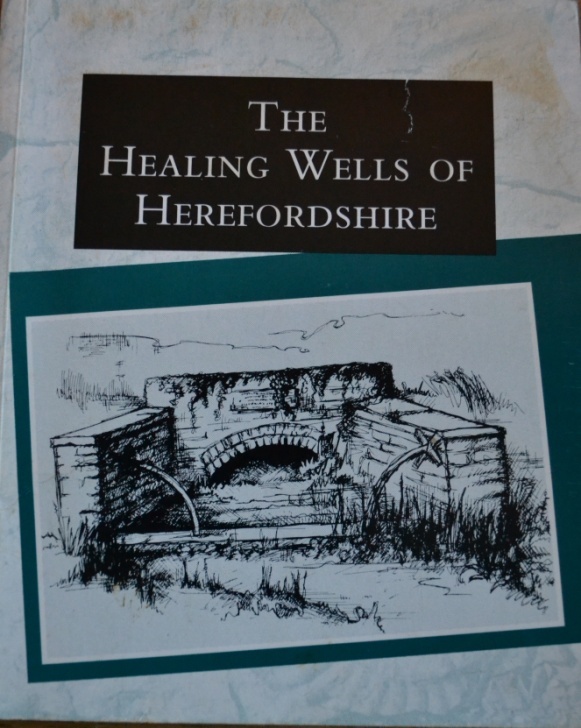 The Healing wells of Herefordshire by Jonathan Sant (1994) A delightful book which combines histories of the sites with a field guide with copious illustrations and photos. I found this very useful in my explorations into the county with its clear readable approach. Recommended, if a little difficult to find. The Sacred Stones, Sacred Trees, and Holy Wells of Hay and the Neighbourhood by C.G., Portman (1907). Should be freely available as out of copyright but I have yet to find it. Holy Wells and healing springs of Hertfordshire: : A Gazetteer and Field Guide to Holy Wells Mineral Springs Spas and Waters with Associated Folklore by R. B. Parish (2008) Second volume in the series. The only book to have covered the subject in this county and despite missing some sites, they’ll be in the gazetteer appendix in the Huntingdonshire volume, a near comprehensive guide. 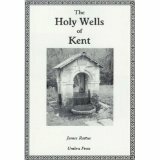 The Holy Wells of Kent by James Rattue (2003) James’s second book, with some help from me kindly acknowledged at the start. This is another top notch guide. Not exactly comprehensive, I found another 10 sites after it went to press and hence my plan to release my version in 2014! Buy both! 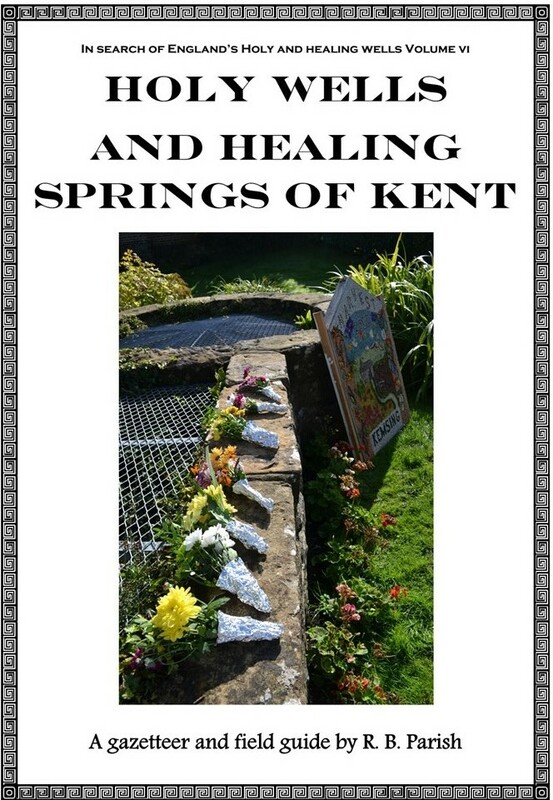 Holy Wells and healing springs of Kent by R. B. Parish (2014) The final volume now available. The Well of Our Lady by Robert Smith (1986) A nice little guide on this lost holy well by the Ladywell Village Society. Worth a look and a good example of how other monograms on wells could be written. The Ancient Crosses and Holy Wells of Lancashire. With notes on the pre-Reformation churches, monastic institutions…by Henry Taylor (1906) A great pioneering book and invaluable academic survey. 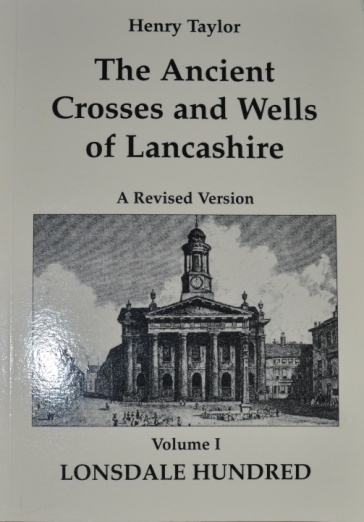 The ancient crosses and wells of Lancashire – a revised version by Henry Taylor (1994) The original being impossible to get and very expensive if tracked down, this abbreviated version provides good details on the sites. 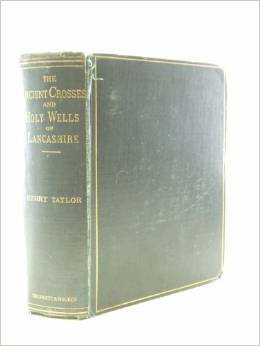 Henry Taylor, The Ancient Crosses and Holy Wells of Lancashire – A Revised Version IV: Salford Hundred by A.J Noble and J.A. Hilton (2004). 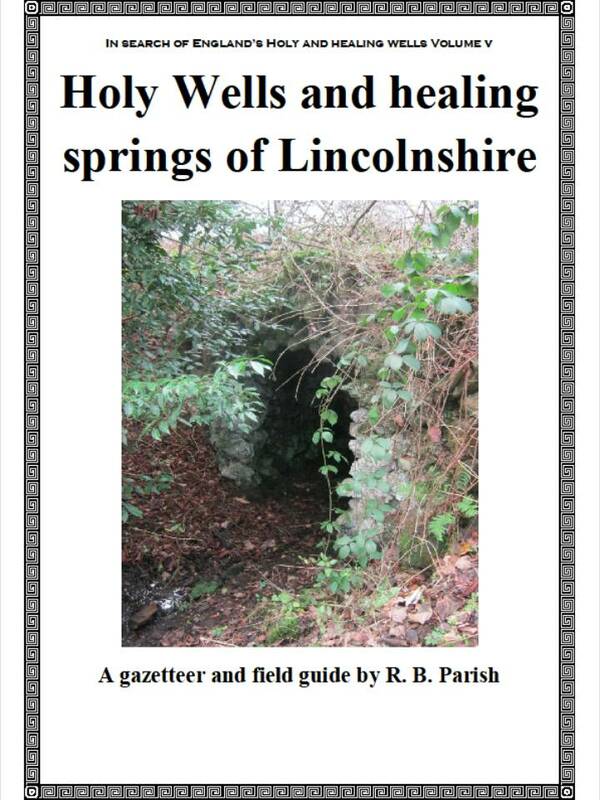 Lincolnshire springs and wells – a descriptive catalogue by Ian Thompson (1999) A very good field guide covering more than just holy and healing sites but a wide range of significant sites. An excellent field guide with good instructions. My only criticisms are a lack of photos especially with some sites it would have helped and that despite a piece of analysis at the end it really only covers extant sites. Holy Wells and Healing springs of Lincolnshire : A Gazetteer and Field Guide to Holy Wells Mineral Springs Spas and Waters with Associated Folklore by R.B. Parish (2012) The essential field guide and history of the county, a number of sites are re-discovered. Essential. 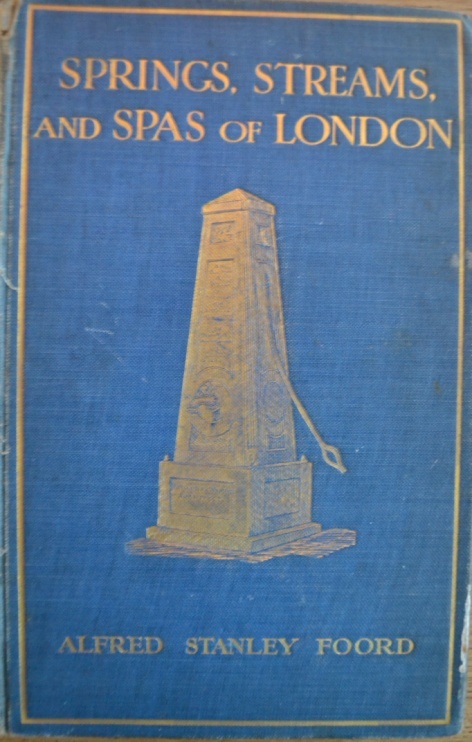 Springs, Streams and Spas of London; History and Associations by Alfred Stanley Foord (1910) A brilliant book full of historical notes, although sometimes it does ramble, a large number of sites are covered and there are some very good plates and photographs. A book of its time and still influenced by Victorian fancies it is never the less a great book. Old London Spas, Baths and Wells by Septimus Sutherland (1915) Wait all that time and two books on the topic arrive almost at the same time. Despite Foord appearing to mopped the subject up, the great named Septimus, builds upon this work and produced an even more readable and useable guide with a good series of photos. A beautiful book and well set out. 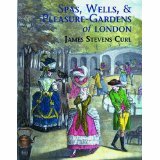 Spas, Wells, and Pleasure Gardens of London by James Stevens (2010) A new book, which I have yet to read and on my Christmas list. Taking the Waters in Norfolk by Mary Manning (1995) a very good introduction to Norfolks spas, mineral springs and the main holy wells. Not exactly comprehensive but very well researched. A paper from the Norfolk Industrial Arch.Soc. Holy Wells and Ancient Crosses of Norfolk and Suffolk by Michael Burgess (1978) East Suffolk & Norfolk Antiquarians Occasional Paper 2. A rare and valuable item which I have never seen for sale! Peculiarities of Waters and Wells. How they were explained 200 years ago and how they are explained to-day. Northamptonshire holy wells. Northamptonshire spas by Beeby Thompson (1915). One first works to record and research via field work our holy and healing water histories. The author did copious field work and its very comprehensive with some very useful photos and drawings. 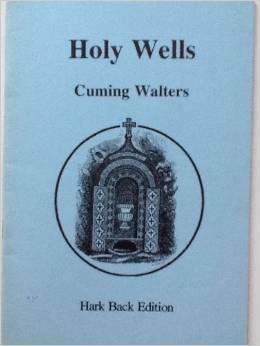 Holy wells of Northamptonshire by Mark Valentine (1988) Almost impossible to get hold of, this privately published work by Source, the short lived and rather erratic holy wells journal is an excellent guide to a little studied county. Misses having pictures but worth picking it. 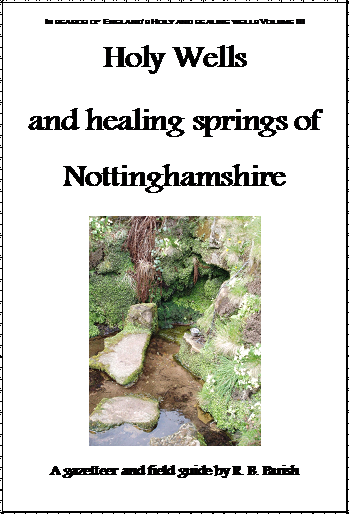 St Ann’s Well and other medicinal and Holy Wells of Nottingham by R.W. 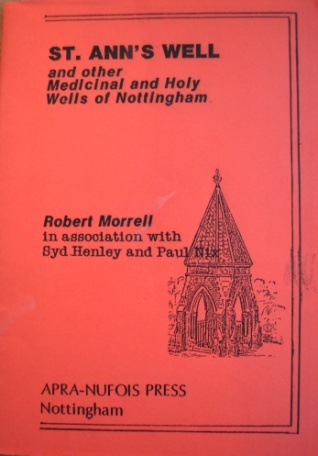 Morrell, Syd Henley and Paul Nix (1987) A great little book, focusing on St. Ann’s Well and the city of Nottingham’s wells. Real resource for a city study. 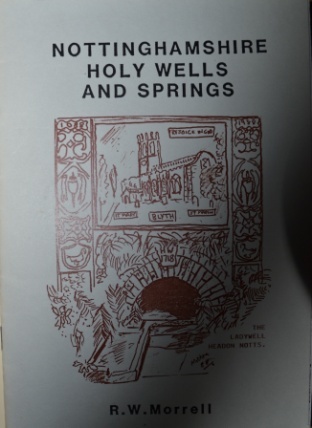 Nottinghamshire Holy Wells And Springs by R W Morrell(1988) The second of Bob’s excellent trail-blazing works. Despite missing quite a lot of sites and some errors this is nevertheless a worthy book and if you have the latter Holy Wells and healing springs of Nottinghamshire below this is too essential. Holy wells and Healings springs of Nottinghamshire : A Gazetteer and Field Guide to Holy Wells Mineral Springs Spas and Waters with Associated Folklore by R. B. Parish (2010)Third volume in the series, I was at first rather nervous of covering the county as Bob had done it not that long before, however as I begun it became clear the previous work was far from comprehensive and lacked appropriate field notes and photos. I am glad I did because I found double the number of sites of that work! Robin of St. Ann’s Well Road by David Greenwood (2007) a great local monograph by the man who rediscovered St Ann’s Well’s site. Shropshire Wells and Mineral Springs by Anonymous (undated). I have no knowledge of what this book is like as I have been unable to find a copy. Somerset Holy Wells and other named wells by Dom. Ethelbert Horne (1923) A delightful book with some good photos and detailed accounts of most of the sites. This still useful in helping research wells in that county as Horne gives good descriptions to where they are located. Pick up a copy if you can although it is difficult to locate. 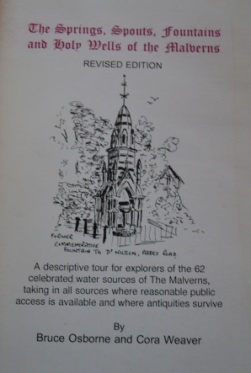 Holy Wells of Bath and Bristol Region (Monuments in the Landscape) by Phil Quinn (1999) One of the best county guides, informative, full of pictures and instructions, an example of how to do it well! Just the right size to use in the field and absolutely essential if visiting Gloucestershire or Somerset. 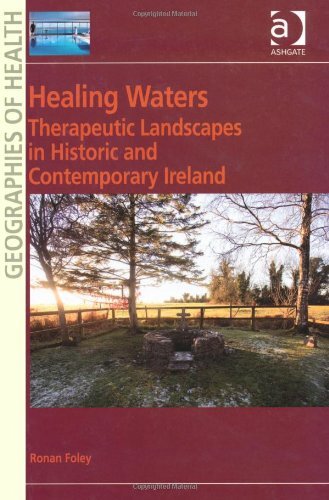 Healing Waters: The Mineral Springs and Small Spas of Somerset by Geoffrey Body and Royal Gallop (2005) An excellent little volume which fills in the gaps left by Horne and well written and researched. 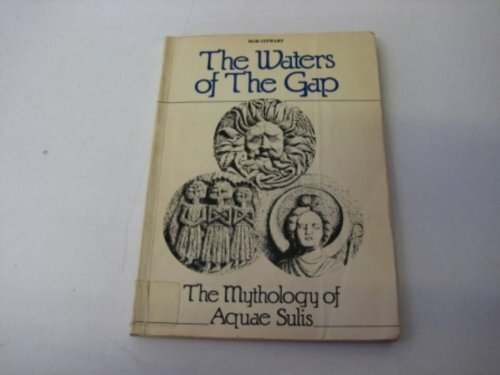 The Waters of the Gap – the Mythology of Aquae Sulis by R. J. Stewart (1981) An interesting analysis of the legendary history of the famed hot springs. The Chalice Well, Glastonbury by F Hardcastle (1951). 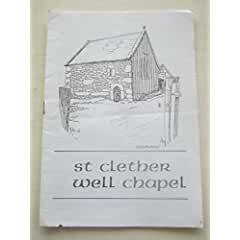 Often reprinted by the Chalice Well Trust a good history of the noted site. The Enchanting Place: Facets of the Chalice Well by Ann Proctor (2006) A New Age analysis of this sacred space and place. The holy well and the Chapel of St Anne in the Wood, Brislington, Bristol by Ken Taylor an excellent book much recommended. ‘The church and well of St Chad’ by J.A Langford (1896), in William Andrews, ed, Curious Church Gleanings. 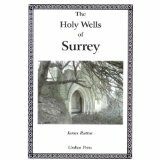 The Holy Wells of Surrey by James Rattue (2008) Last, unfortunately so he tells us, of James’s county works, but what a way to finish. I was researching the county myself but so glad I didn’t finish it! James yet again reveals a number of very interesting sites in a county you wouldn’t expect there to be any including the folly Bonspring font, which is on my to do list! Sussex – East and West – no book yet! Warwickshire – no book yet! 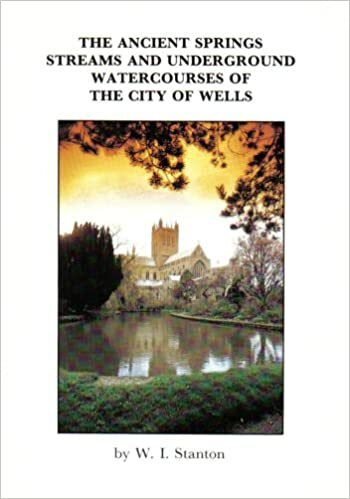 Aquae Malvernensis by Cora Weaver and Bruce Osbourne (1994) A great history and guide to all wells, springs and pumps of this great place for well enthusiasts. 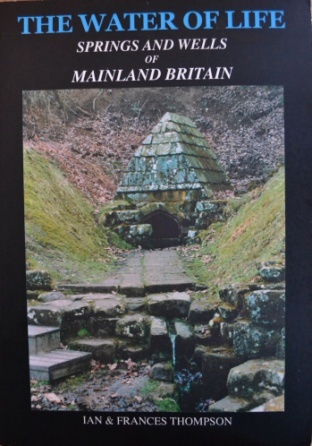 Springs, Spouts, Fountains and Holy Wells of the Malverns by Bruce Osborne and Cora Weaver (1997)The authors have carved a niche in works on both mineral springs and in particular the Malverns. This is a brief field guide to the sites in the Malverns as a more fieldwork friendly guide to the above excellent work. 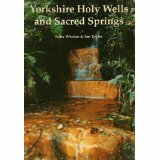 Yorkshire Holy Wells and Sacred Springs by Edna Whelan and Ian Taylor (1989) A brilliant and vital if in the county with very useful field guide notes and instructions and black and white drawings, a work with again is part of the New Age revival with some generalisations but this notwithstanding as a region by region guide nothing has come close, bar the second authors website updates. 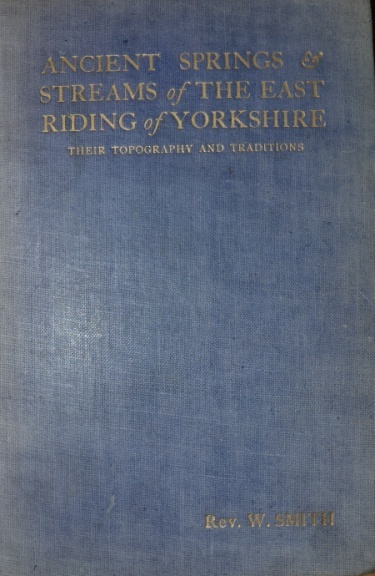 The ancient springs, streams of East Riding of Yorkshire by Rev E. Smith (1923) A rare but important work, despite being by a vicar is a balanced approach to the subject. Each site is covered with copious notes regarding their history and the author attempts field work. 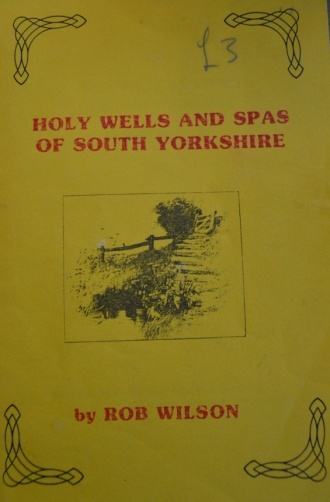 Holy wells and spas of South Yorkshire by Robert Wilson (1990) A privately published work, rather lacking in photos but high on details of extant and lost sites in this ‘modern’ county. It includes spas and sites associated with folklore despite the title and is very useful as a field guide. Pick it up if you can. 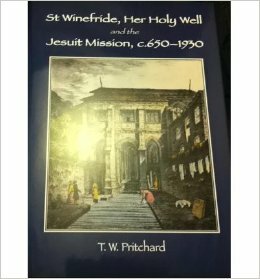 The Wells and Springs of Leeds by Feorag NiBride (1994) A rare piece and as such I have not seen a copy! 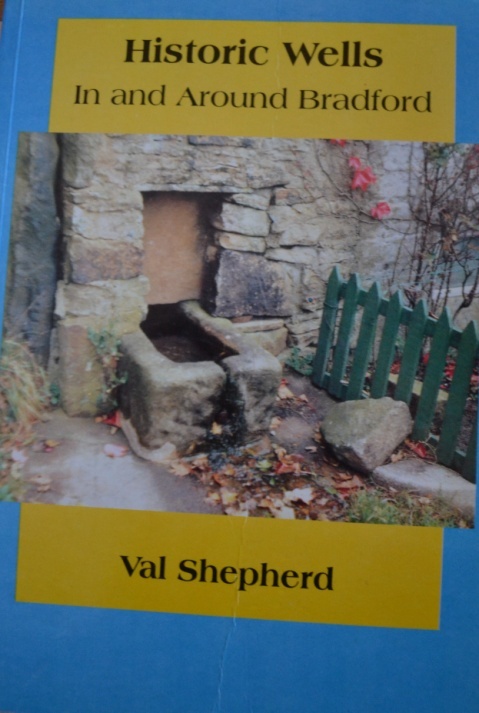 Holy Wells of West Yorkshire and the Dales by Val Shepherd (2002) Covers some of above but goes into other areas. Some sites covered not covered elsewhere and again has some useful illustrations. Coming soon Non-British holy well books! Hi I’ve come across your excellent site, I think I might be following it! Great bit of research much like my own endeavours. Do you know if there is any significance to the site? I know it is associated with a black dog, but are there any healing qualities. Look out soon for my book on Staffordshire holy wells by the way. Excellent – an invaluable source!